I have spent my career in public service as an attorney serving in many capacities. I was City Attorney for the City of Springfield, Missouri, for 33 years, and before that served as City Attorney for the City of Cape Girardeau, Missouri, and as an Assistant Legal Counsel for the Missouri State Highway Commission (now MoDOT). After retiring as city attorney for the City of Springfield in 2005, I continued in private practice until August 2015, serving some 3 1/2 years as Of Counsel with the law firm of Carnahan Evans Cantwell Brown. In August 2015, I retired from the practice of law even though I continue to have an interest in public policy and local government law. I have written several amicus briefs for the MML in cases that have state-wide implications, like the recent 2009 Missouri Supreme Court decision, which upheld a higher sewer connection fee for one area of the City of Sullivan. In 2009, I filed an amicus brief on behalf of the Missouri Public Utility Alliance in the City of Hermann case, that helped to successfully defend a Hancock challenge to utility charges by the City of Hermann. More recently, I filed an amicus brief on behalf of the MML and the Missouri Public Utility Alliance before the Missouri Supreme Court in a case that challenges the storm water impervious runoff charge by the Metropolitan Sewer District. I served on the MML Board of Directors for a number of years and as President and Vice- President of the Missouri Municipal Attorney’s Association. I am active in the International Municipal Attorney’s Association (IMLA), currently serving as the MML representative to IMLA. I have also served three terms as Chair and Vice-Chair of the IMLA Committee on Personnel and Labor Relations and two terms as Chair of IMLA’s Economic Development, Taxation, and Finance Section. In addition, to authoring numerous articles on municipal law, I have written a Missouri Bar CLE chapter on Public Employer-Employee Law and I have taught Employment Discrimination law at Southwest Missouri State University (now Missouri State University). After the Kelo decision by the United States Supreme Court, I was appointed by Governor Blunt to serve as a member of the Governor’s Eminent Domain Task Force for Missouri, which recommended a number of important changes to the eminent domain laws of Missouri. After retiring from the City of Springfield as City Attorney I served as Special Counsel to the City of Springfield primarily as Special Counsel to the Environmental Services Division of the Public Works Department. As Special Counsel, I drafted a put or pay agreement with the two major waste haulers’ in Springfield in order to secure revenues in excess of twenty million dollars to help pay for solid waste environmental services. In the 1980’s I was involved in the drafting of the current solid waste state law and in the 1990’s I participated in the filing of an amicus brief before the United States Supreme Court involving flow control. Since 2006 I have edited the Missouri Municipal Attorney’s newsletter, which discusses important municipal law cases applicable to Missouri local government, which may be accessed by clicking here. Throughout my career I have been dedicated to finding solutions to complicated community problems. My work in finding solutions to these community problems has been recognized by the Missouri Municipal League, awarding me their Distinguished Service Award and by the Missouri Municipal Attorneys Association making me the first recipient of the Lou Czech Award for outstanding service as a Municipal Attorney. Even though I have retired from the practice of law, my interest in local government and public policy continues. Now that I am retired, I am hoping to have additional time to write about matters that are of interest to local government officials on my blog. 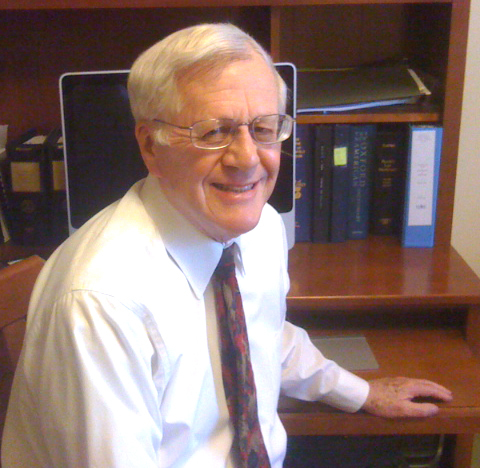 During my 49 year career as an attorney I have been blessed with a law practice that was interesting, exciting, fun and very enjoyable. I may be reached at 417-569-0386 or you may e-mail me at howardwrightjr@me.com. The views expressed by myself on my blog are strictly my personal views and not the views of any other individual or organization. I do not endorse or support comments made to my Posts. Please feel free to contact me.